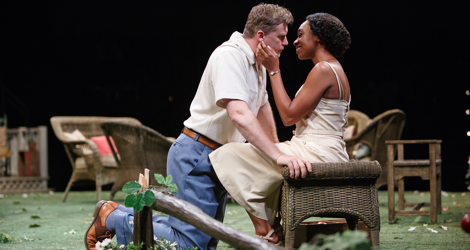 Arthur Miller’s first successful play, All My Sons, is the first must-see of Stratford’s 2016 season. The play may concern the aftermath of World War II in the U.S., but its theme of taking responsibility for corporate failures and its examination of the personal cost of placing business expedience over business ethics is still painfully relevant. But more than that, the production directed by Martha Henry shows an ensemble of actors at the peak of their powers enacting a story that builds in unrelenting tension right up to its devastating conclusion. Written in 1947, two years before Death of a Salesman, All My Sons is also a product of Miller’s quest to write an American tragedy, a tragedy of the common man. Its main character is Joe Keller, an ordinary man with a minimal education who rose from nothing to run a factory that manufactured aircraft engine cylinder heads during the war and has now diversified into other products. Before the action of the play, Keller and his business partner and neighbour Steve Deever were put on trial for knowingly shipping defective cylinder heads to the Air Force which resulted in the deaths of 21 fliers. Both men pleaded their innocence, with Keller blaming Deever for making the decision on his own. Keller was exonerated but Deever was found guilty and sent to prison. Three-and-a-half years before the action of the play, Keller’s older son Larry, an Air Force pilot, went missing in action. Keller (Joseph Ziegler) and his younger son Chris (Tim Campbell) have accepted the fact that Larry is dead. Keller’s wife Kate (Lucy Peacock), however, still holds out hope that he is alive and newspaper stories of troops returning home years after they went MIA have helped sustain Kate’s belief. The constant worry has undermined Kate’s health. This painful situation becomes worse when at Chris’s invitation, Ann Deever (Sarah Afful), Larry’s fiancée, who used to live in this small town in Ohio, comes to visit. Everyone knows why she has come. Chris, she and Larry all grew up together and following Larry’s death she has fallen in love with Chris. Chris intends to propose to her while she is there and tell his parents. Kate, of course, will never allow such a marriage because she refuses to believe Larry is dead. To further complicate matter, both of Deever’s children, Ann and George (Michael Blake), cut off all communication with their father once he was convicted. George has since become a lawyer and decided finally to visit he father in prison. Now believing his father’s side of the story, he rushes back to his childhood home also to prevent Ann’s marriage. Kellers’ their neighbour and doctor Jim Bayliss (E.B. Smith) and their neighbour to the other side Frank Lubey (Rodrigo Beilfuss) who haven’t seen Ann for three years. Early in the play when any serious topic arises, one of the characters will say that it is not the right time to talk about it. However, when it becomes clear that Chris intends that his parents come to a special dinner, obviously to celebrate his engagement, difficult questions have to be faced. Can Chris marry the daughter of a murderer? Has Ann really given up hope that Larry is alive? When George arrives with his news from his and Ann’s father, the subject of what really happened when the faulty parts were shipped out comes to the surface. The cast is superb across the board and all of them are capable of speaking superficially innocuous words while conveying their accusatory subtext. Joseph Ziegler’s voice may now be hoarse, but that is fitting for an older retired man and he has lost none of his expressivity. In the first act his Keller comes off as likeable older man, good with children and friendly with neighbours. Keller is less bright than Doctor Bayliss but more sensible that his horoscope-obsessed neighbour Frank. Because he approves of Chris’s marriage to Ann and worries about Kate’s fantasies, he starts as our prime point of stability. Yet, as the action progresses, Ziegler reveals other sides of Keller that are not so positive like fearfulness, cowardice and impenitence. In contrast Lucy Peacock’s Kate begins the play apparently in near hysteria and repeatedly has to be calmed down by others. The fact that a tree planted as a memorial to Larry has blown down has set her off as has Ann’s arrival. Though Kate is perfectly polite to Ann, Peacock makes clear before Kate says anything what Kate’s real attitude is to both Ann and Chris for planning what Kate sees as a betrayal of Larry. At other times Kate advises Keller to “Be smart”, a mysterious warning at the time but one that gradually reveals that Kate’s father in Larry’s survival is somehow connected to her knowledge of what Keller and Deever did during the war. Peacock has Kate’s emotions trace a zigzag path of raging and subsiding, the height of her rage carefully growing bigger with each outburst. Peacock has also adopted some of Martha Henry’s mannerisms such as touching her interlocutor or adjusting her clothes, but Peacock has made them her own since they help indicate the emotions roiling inside Kate that she tries to repress. the war. Around Ann, Campbell shows that Chris still has the bashfulness of a boy, but around his father and his former friend George Campbell shows us the forceful man Chris has become who likely will find life in a small town too suffocating for his talents. Sarah Afful is delightful as Ann. Afful makes clear that Ann is someone who knows Chris better than he knows himself. While Ann can be polite, she has no hesitation in standing up for herself if she is attacked. Ann’s position in the Keller household is uncomfortable, and Afful does not conceal the stress Ann feels. Ann happens to be in possession of information that no one else knows, so that when disputes run high Afful has Ann regard them with a strange objectivity. Michael Blake is in only one scene as George, but he makes that an extraordinarily powerful scene. George’s arrival is as if a bomb had been lobbed into the Keller’s backyard that everyone is intent on defusing. Oddly enough, it is Kate who is best as pacifying George with reminders of past friendship. Blake is excellent at depicting how the rage that filled George gradually drains out of him under Kate’s influence. The secondary characters are all strong. E.B. Smith has the kind of authoritative voice and manner that you wish all doctors had. Lanise Antoine Shelley is a fine comic figure as Bayliss’s wife Sue, who can get the doctor to do whatever she wants and who can insult someone like Ann in the friendliest possible way. Rodrigo Beilfuss and Jessica B. Hill are also comic figures as Frank and Lydia Lubey, rather like Ed and Trixie Norton in the old television show The Honeymooners. Yet, though Frank’s belief in astrology seems naive, Beilfuss is able to make it seem that Frank’s very innocence may make him a vessel for higher knowledge, like the “wise fool” in literature. Henry’s most noticeable change to the play is in casting a black actor as Ann and in having the Kellers live in a racially mixed neighbourhood. In her “Director’s Notes” Henry explains how this came about – how finding in Sarah Afful the best Ann Deever, all the rest of the casting fell into place. On a practical level, this choice gives a number of fine actors of colour the chance to display their talent in a work in which they would not otherwise appear. On a symbolical level, it suggests that the partnership that Keller had with the now-jailed Steve Deever may not have been as equal in Keller’s mind as he likes to think. The racial aspect also provides another reason why after Keller’s trial the neighbourhood has never fully accepted him back. There is not one word about race in the original play, but Henry’s addition of race as a factor allows Miller’s play to comment about people’s responsibility to each other in more ways than Miller intended. The Tom Patterson Theatre has been reconfigured as a theatre in the round. With All My Sons this has the effect of causing us as the audience to appear to be sitting in judgement on what we watch transpire in front of us. It also suggests that there is no way for the characters on stage to escape the judgement of others. The set, the acting and the direction all combine to make All My Sons the most powerful, the most harrowing non-Shakespearean play to be presented at the Tom Patterson Theatre since Chekhov’s Three Sisters in 2009 which was also directed by Henry. Photo: (from top) Tim Campbell as Chris and Sarah Afful as Ann; Lucy Peacock as Kate; Tim Campbell and Joseph Ziegler as Joe Keller. ©2016 David Hou.